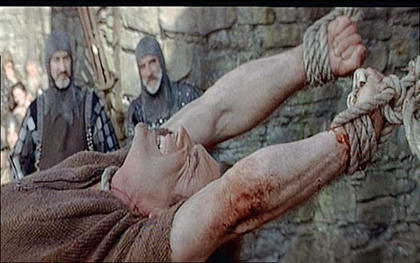 After sitting through Braveheart a second time, I would gladly inflict this punishment on Mel Gibson. The 68th annual Academy Awards, for the film year 1995. The nominations were announced on February 13, 1996 and the awards were held on March 25, 1996. The Race: By the end of the summer blockbuster period in 1995, the only film that had made a lot of money and also earned solid reviews was Apollo 13. The biggest hit of Ron Howard’s directorial career, commercially and critically, it was the story of the failed mission to the moon and had Tom Hanks in the lead. From the minute it opened, it seemed like a sure bet to be competing for Oscar gold, but its competition didn’t seem to be anywhere in sight. But amidst the commercial success of critical disasters like Batman Forever, Die Hard with a Vengeance and Casper were a few films that seemed to be pushing their way to try to join Howard’s film. First, there was Smoke, a small film from Wayne Wang that seemed to be the exact opposite of Apollo 13 in every way – small, dealing mostly with a single corner in Brooklyn, without star power, it nevertheless earned good reviews and strong word of mouth. 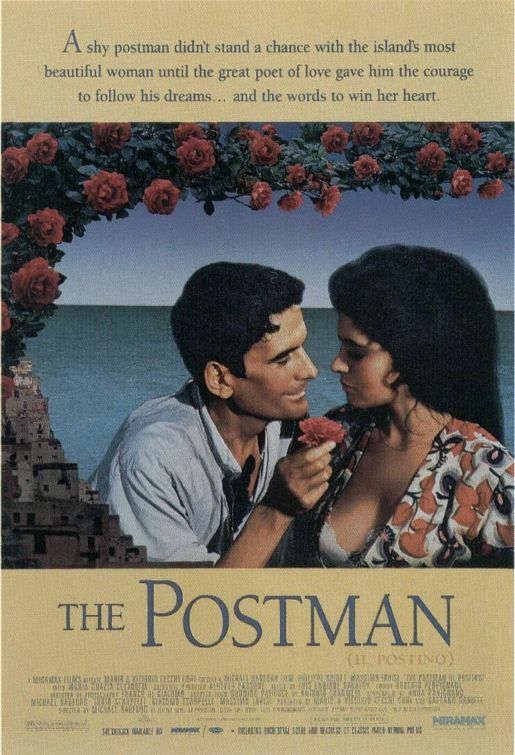 There was Il Postino, the Italian film that had three things going for it – the power of poetry which was giving Pablo Neruda the same kind of comeback in sales that Auden had earned the year before after Four Weddings and a Funeral, the marketing might of Miramax, which had earned three straight Best Picture nominations now, and the additional talking point that star Massimo Troisi had been so dedicated to finishing the film that he put off a heart transplant and then died the day after filming was completed. 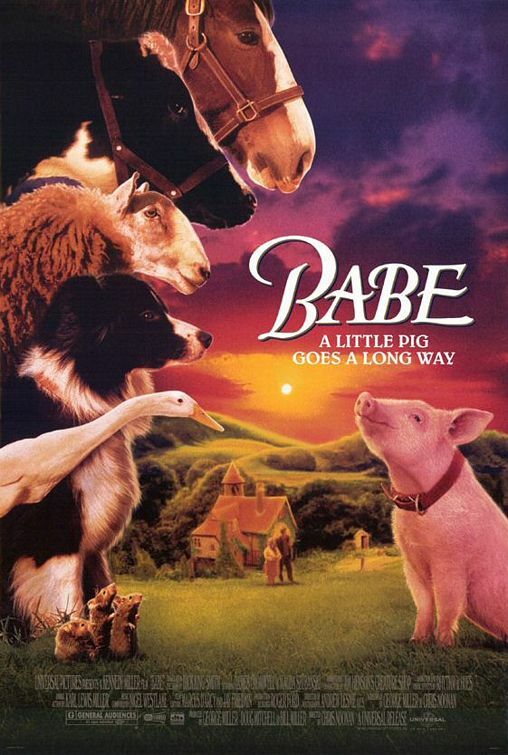 There was also Babe, an Australian film about an intrepid pig who becomes a sheep herder that was winning over the hearts of kids and adults. But with a full slate of fall releases aimed at the Oscars, it didn’t necessarily look like anything else had the heft to join Apollo 13 in the race. 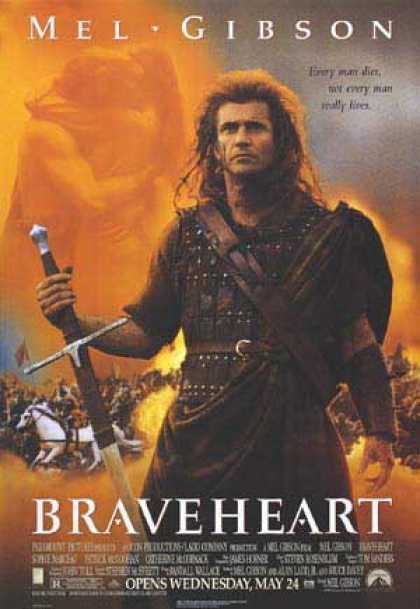 To kick off the fall, Paramount re-released Braveheart, the May release from Mel Gibson (as star and director) that had done okay at the box office (though not okay enough to earn back its cost) and earned mixed reviews. With no chance of it being a big box office hit, Paramount was now hoping to at least earn it some more attention from Oscar voters. Next up was The Usual Suspects, a smart thriller from young director Bryan Singer that instantly had everyone talking about its ending and whether or not the film worked as a whole. Then came Get Shorty, adapted from the Elmore Leonard best-seller, with John Travolta continuing the comeback that had begun with Pulp Fiction. That was followed the next weekened by Leaving Las Vegas, a film no one wanted to talk about as they left the theater because it was so depressing, but which earned mountains of praise for its two stars Nicholas Cage and Elisabeth Shue. It also had death in its publicity, as the author of the original novel killed himself just after the film started production. December didn’t quite bring the big films that Oscar watchers had come to expect. Two of the biggest films – Nixon and Casino, from directors Oliver Stone and Martin Scorsese, suffered from critical comparisons to their big Oscar films earlier in the decade – JFK and GoodFellas. That left really only two December films fully in the Oscar race. The first was Dead Man Walking, with Tim Robbins going behind the director’s chair to direct his companion, Susan Sarandon. Sarandon and star Sean Penn earned the best reviews of their careers and the film looked set for major Oscar nominations. 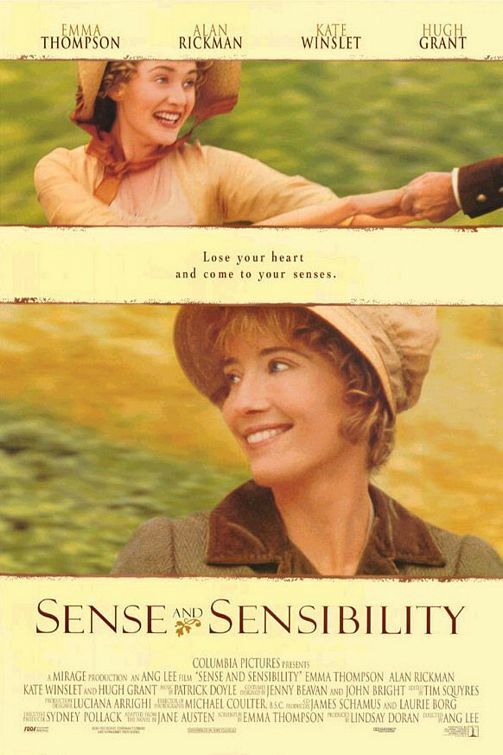 The other was Sense and Sensibility, an adaptation of the Jane Austen novel, with Emma Thompson writing the screenplay and directing from acclaimed Taiwanese director Ang Lee, whose previous two films, The Wedding Banquet and Eat Drink Man Woman had both been nominated for Best Foreign Film. On the same day that Sense and Sensibility opened, the National Board of Review gave it a leg up by giving it Best Picture, Director and Actress, officially kicking off the Oscar season. The next day, Lee and Thompson were getting more awards (though Thompson’s was for Screenplay this time), when the New York Film Critics gave their awards, but they saved Best Picture for Leaving Las Vegas. Vegas scored even bigger a few days later when the LA Film Critics gave it Best Picture, Director, Actor and Actress, the first film to ever win all four in LA (though Thompson won Screenplay again). The Golden Globe nominations established Apollo 13, Sense and Sensibility and Leaving Las Vegas as the front-runners, with Picture and Director nominations for all three. Babe and Get Shorty were in the Best Picture – Comedy race (with Travolta expected to win Best Actor – Comedy), but the surprise showings were the Picture, Director and Screenplay nominations for Braveheart and The American President, joining Sense and Sensibility as the only films with all the big three nominations. Before the actual Golden Globe awards, the National Society of Film Critics added their awards; Leaving Las Vegas again won Actor, Actress and Director, but this time the surprise winner of Best Picture was Babe. Then came the Boston Society of Film Critics, who brought everything full circle by giving Picture, Director and Screenplay to Sense and Sensibility. At the Globes, Babe was able to overcome Rob Reiner’s directorial nomination and John Travolta’s Best Actor win to take Best Picture – Comedy. More surprising was that Mel Gibson managed to beat out Ang Lee, Ron Howard and Leaving Las Vegas director Mike Figgis for the Best Director award. But Sense and Sensibility did take home Best Screenplay yet again and, more importantly, Best Picture – Drama. The Producers Guild made things interesting, with its slate of nominees: Apollo 13, Sense and Sensibility, Leaving Las Vegas, Il Postino, Dead Man Walking, The Bridges of Madison County and The American President. No film had ever won Best Picture without a PGA nomination, so this looked good for the trio of Apollo 13, Sense and Vegas. Then the Directors Guild listed their nominees: Howard, Lee, Gibson, Figgis and Il Postino director Michael Radford. Thompson would be competing with the Apollo 13 and Leaving Las Vegas screenwriters in the adapted category (as well as Babe and Get Shorty), leaving Braveheart in good position for the Original Screenplay award. Now, coming down to the nominations, it looked like a three-way race between Apollo 13, Sense and Sensibility and Leaving Las Vegas. Braveheart now had to be seriously considered for the fourth slot. This left Babe, Il Postino (with the Miramax marketing team working overtime) and Dead Man Walking fighting over the fifth and final nomination. The Results: Suddenly, on the morning of February 13, the race was over. Technically, there were five Best Picture nominees: Sense and Sensibility, Apollo 13, Braveheart, Babe and Il Postino. Leaving Las Vegas had earned Actor, Actress, Director and Screenplay nominations but was out of the Picture race – the first film to do so since Sunday Bloody Sunday in 1971, while Dead Man Walking had Actor, Actress and Director nominations. But the directors displaced by Figgis and Robbins were not Radford and Babe director Chris Noonan, but rather Ang Lee and Ron Howard. So now, instead of a two-way race between Apollo 13 and Sense and Sensibility, with Braveheart considered an outside shot, the nominee list consisted of a foreign film, a kids film, two films with no Director nominations and Braveheart. The momentum was slowed somewhat – the Directors Guild bestowed their honor upon Ron Howard – only the second director win the DGA after failing to earn an Oscar nomination (the first being Spielberg in 1985) and then Apollo 13 won the PGA and the new Cast Performance award at the Screen Actors Guild. Sense and Sensibility won the WGA, though Braveheart won the Original Screenplay award. Then, early wins on Oscar night went to Apollo 13 (Editing and Sound), Babe (Visual Effects) and Il Postino (Original Score). More surprisingly, The Usual Suspects won Best Original Screenplay. This was big as no film had ever lost Original Screenplay to a non-Best Picture nominee and still gone on to win Best Picture. But then Gibson won, as expected at this point and then Braveheart capped off the night with Best Picture. That fire in the background? That's historical accuracy. Producer: Bruce Davey / Mel Gibson / Allan Ladd, Jr. The Film: Braveheart makes me want to scream. The first reason is that I actually know people who continue to insist that it is a great film. Secondly, because it somehow managed to win Best Picture at the Academy Awards – the worst choice the Academy made in over 40 years. Thirdly, because it is unbelievably bad history trying to masquerade as non-fiction. Fourthly, it is not a good film. Nothing about the film constitutes what is necessary to being a good film. Fifthly, because it shows that the directors can completely screw up the Oscar race. Look at the Oscar race. Films without a Best Director nomination don’t win Best Picture. It has happened once since 1932. That’s a fairly solid rule that you can count on. So, when the directors in 1995 for some inexplicable reason decided not to nominate Ang Lee and Ron Howard, what had been a three way race for Best Picture suddenly became no race at all. The general Academy voters weren’t going to vote for a kids film or a foreign film. That left Braveheart. It won almost by default. How? This film is a crime against history. Hell, it’s a crime against a lot of things, which makes me wonder who the hell voted for it. I can’t imagine it was anyone English – the ridiculous notion put forth that William Wallace might have sired their King Edward III, in spite of the fact that Wallace died when Edward’s mother was just a little girl (in spite of what idiotic notion you might have gotten from this film) makes it a slap in the face to English history. It sure couldn’t have been anyone Scottish – this film just claimed that Robert the Bruce, the single most vital person in Scottish history, the man who actual did win Scottish independence, was a traitor to the “true” hero of Scotland – William Wallace. It certainly wasn’t the gays – the pathetic effeminate portrayal of Edward II and the way his father kills his lover shows the homophobic roots at Gibson’s heart that have been obvious for years (why wouldn’t he hate the gays, anyway – he seems to hate everyone else). There is a very long list of the historical inaccuracies of this film – from Wallace’s roots (he was a landowner, not a peasant), to the relationship with the princess (who didn’t come to England until after Wallace was dead and was 10 when he died) to the very title itself (the name comes from a poem about Robert the Bruce, not Wallace). They even get a lot of small details wrong, from the kilts, to the speaking of French at court to gain privacy. Now, all of this can be done well – the battle scene was moved because it worked better cinematically and that makes sense. But you can’t go around claiming that this film is based on established fact (as Gibson and screenwriter Randall Wallace did very much so at the time and have continued to do for years) when you know that most of the “facts” in your film are a bunch of crap. This isn’t like In the Name of the Father, where they tried to approach the film through the father / son relationship and decided to place them in the same prison cell when they weren’t even at the same prison. This is ridiculous crap romance by having Wallace seduce the princess even though they never met – bad choices made for bad reasons and all of it done with sloppy research. But the bigger crime is that this is just not a good film. It is true that Gibson has a directorial eye and that the cinematography is always good in his films (even though it’s not as good here as it seems – the editing is deliberately designed at times to overlook that the cinematography isn’t quite right and the big battle scene is choppily edited to hide the fact that there’s not a good pan shot – just a bunch of close-ups, presumably because there weren’t enough extras to get a good wide shot), that he gets the right music, that the sounds ring true. They are also bloody as hell, which seems to be Gibson’s style and is always much more than necessary – I have recoiled from the amount of violence in Gibson’s films because they always seem to be way over the top. But the two core things of the film never come together – the acting and the writing. The acting is terrible, all throughout, and most especially with Gibson. It is true that he didn’t originally want to star but that was the only way to get the studio money. But did he have to be so awful? Nearly every major line he screams out like he’s a giant ham waiting to be cooked, and seeing this again now, I can only think of comparing it to the awful acting in 300 and wait for him to say “This is Scotland!” But nothing is worse than the writing. Randall Wallace could have actually written a historically accurate script, he could have emphasized the bravery and eventual horrific death of Wallace without taking away from Robert the Bruce or making Edward I a comically over-the-top villain or without a ridiculous love scene with the Princess of Wales (who, by the way, married Edward after he was king, so never was the Princess of Wales). This film is so agonizing because it could have been done right – if they had just cast Gleeson in the lead role and gotten a director who knows how to work with actors, this could have been the epic that people keep claiming that it is. Instead of a waste of three hours for the second time in my life. This is how I prefer to get my Jane Austen: on the screen. The Film: There is a moment at the climax of the film that shows off, not only what an amazing actress Emma Thompson is, but also how perfect Gemma Jones can be and the amazing talent that everyone was suddenly discovering in Kate Winslet. Edward Ferrars (Hugh Grant) has come to the home of the Dashwoods to see Elinor (played by Thompson). In the course of a conversation with Elinor, Marianne (Winslet) and their mother (Jones), it become clear that Edward, in spite of what the Dashwoods had been told, is not married. Jones, realizing what is being said, slowly turns to look at Thompson. Thompson slowly stands as she digests this news and when it is stated clearly, she breaks down in tears, in a wonderful, passionate, realistic scene. Then Jones and Winslet lock eyes and realize they must now politely, but quickly, leave the room, dragging the youngest daughter with them. Words don’t need to be said as they exit. And that is what makes the film versions of Jane Austen’s novels so wonderful while the novels are so difficult to get through. Ms. Austen was a keen observer of the social ways of her time, of how people communicated, of how they spoke, of how they interacted, how love could and would be pushed to the side. But the romantic side of her always won out and her characters triumphed far more in her fiction than they would have in real life. Through all the ills, they always managed to overcome the cad (there seems to always be a cad in Austen’s novels – Willoughby here and Ewan McGregor’s character in the version of Emma that would follow the next year) and find the person they longed to be with and who, in fact, they were meant to be with. Thompson pulls double duty here – not only as the elder daughter Marianne (here changed from 19 to 27, a change that makes much more sense to modern audiences), but also as the screenwriter. She went through 15 drafts before the film was finally completed, but the work shows through. She knew which minor characters to excise, which ones to keep around in the background until they needed to actually take part in the action (Hugh Laurie as Mr. Palmer is a perfect example – he barely speaks until near the end, and then says what needs to be said and does what needs to be done). By making use of her keen sense of social interaction, but doing away with prose that is difficult to believe and even more difficult to digest (such as “It is a truth universally acknowledged that a single man in possession of a good fortune must be in want of a wife.” which I am aware comes from Pride and Prejudice and not Sense and Sensibility but is a perfect example of a perfectly ridiculous Austen line), we get the heart of the story and the depth of the characters without the novel itself. There is also the cast, of course. Part of what is so wonderful is how all the British actors play so well off on another, how we can marvel in the connections (“there are only six actors in Britain” Veronica is very fond of saying). I count no less than five Harry Potter actors in the film, plus two others (Grant and Winslet) who were offered roles in the series. Hugh Grant plays the brother-in-law of James Fleet, who had been his close friend in Four Weddings and a Funeral, and he and Rickman end up married to sisters while in An Awfully Big Adventure, released earlier the same year, Rickman was in love with the girl who was in love with Grant. And of course, there is the lovely fact that Hugh Laurie and Imelda Staunton play such a wonderfully believable married couple, perhaps because they had already played a married couple three years earlier in Peter’s Friends (which also starred Thompson). You get the sense that these actors all know each other inside and out and they all have perfect chemistry because they have played opposite each other so many times (this is the first of ten collaborations between Rickman and Thompson). I wasn’t quite sure what to expect when I first walked into the Broadway Metroplex to watch this film. I had never read Austen’s novels, though I had seen the Olivier / Garson Pride and Prejudice and enjoyed it. I was a huge fan of Thompson and had loved Grant and Rickman in An Awfully Big Adventure (which, as I mentioned here, no one else saw). But I was won over by the performances, by the direction, by the script, by the wonderful sets and costumes, by the score, by the wonderful cinematography, by all the aspects of the film-making, all of which were Oscar worthy, and all of which the Academy did themselves a disservice by either not nominating (Lee, Editing, Art Direction, Rickman’s performance) or not awarding (everything but Thompson’s script). But it is the film that will endure, far longer than Braveheart, far longer than any of the other nominees, as the best film of the year. The Film: I’m of two minds about this film. It was the first foreign film to break through and earn a Best Picture nomination in 22 years, since Cries and Whispers. During that intervening time, Truffaut (Day for Night), Fellini (Amarcord), Peterson (Das Boot), Bergman (Fanny and Alexander) and Kieslowski (Red) all had films nominated for Best Director and Screenplay and Kurosawa (Ran) had a film nominated for Best Director. None of those films were nominated for Best Picture and all of them were better films than Il Postino. Even in 1995, it wasn’t the best Foreign film vying for Oscar nominations – there was the wonderful version of Les Miserables from Claude Lelouch. So, on the one hand I look at this film and wonder why it had the luck of Miramax and its marketing team pushing it in what was really a pretty weak year. On the other hand, it is a very good film, with a wonderful performance from a dedicated actor at the heart of its story and is a wonderful romance. At its core, this is the story of a rather simple man, a man named Mario. Mario is the son of a fisherman and feels like he is wasting away, approaching middle age in his tiny Italian town. Then two things happen. First, the famed Chilean poet Pablo Neruda comes to town. Then, Mario gets a job as a local postman because he has a bike and is willing to bike up into the hills and deliver piles of mail to Neruda. Both seem to form an equal bond in inspiring Mario. Mario is naive and trusting, and he begins to fall under the influence of the communist politics of his boss at the post office and of the romantic advice of Neruda. Mario is hoping to win the daughter of the local tavern owner, a lush Italian beauty and he believes that Neruda, with his romance with his wife in full bloom and the power of his poetry, is the man to help him do it. In a sense, this is a fairly simple film, but with a few details that bring it to the next level. First, there is the infusion of the film with Neruda’s poetry; the poetry of a man who truly deserved his Nobel Prize. Since the film was being made before Four Weddings and a Funeral, the filmmakers couldn’t have known how well the use of Auden’s poem would serve the film, so it is a nice coincidence that two years in a row a film embraced poetry at its core. Second, the Italian countryside looks beautiful and the score is absolutely perfect for the film (Miramax would later really push the soundtrack and the Oscar for Best Original Score is certainly a reflection of that). But third, and most important, it had Massimo Troisi. Troisi was absolutely dedicated to the film, co-writing the screenplay and playing Mario, only able to work two hours a day, refusing to get the heart transplant he desperately needed because he refused to let the film wait. The film was completed and the next day he died and his passion and determination are in every scene. But what keeps the film from being truly great, is perhaps the ending. Not that it is so bittersweet, but that it seems unnecessary, and more importantly, doesn’t seem like it would have happened. One of the thing about movie romances is that they don’t really seem real; they seem like after the film ends, they can’t possibly hold together. What will these two people talk about? How will they get through the rest of their lives? It’s believable that Beatrice would be won over by Mario, but I can’t really believe that she would have been so devoted to him that we get the scene we get in the epilogue. So, their attempt to go beyond the standard romance actually, sadly, undermines the film a little. But these are trifles. The fact is, a film with no big name international stars, a film in a foreign language, a film about a Communist poet, managed to break through and make it into the Best Picture race. And that, with its wonderful romance, is really what we should remember about Il Postino. The Film: The two films that people were talking about in the summer of 95, at least when it came to serious films that could be Oscar contenders, were at two opposite ends of the spectrum. One of them was a large epic that told a story on a grand scale, lifting away from the planet, taking in the grandeur of all of outer space, life and death and a great moment in human history. It was a macro view of the universe and all the things that could unfold before us. The other was its polar opposite. It was the micro-universe, a story that focused upon one specific spot, with a small group of interconnected characters. It even had one character who took a picture of his corner storefront every day and you look at the pictures and watch this very small corner of the universe unfold over time. Those were the films that critics and serious filmgoers were talking about. 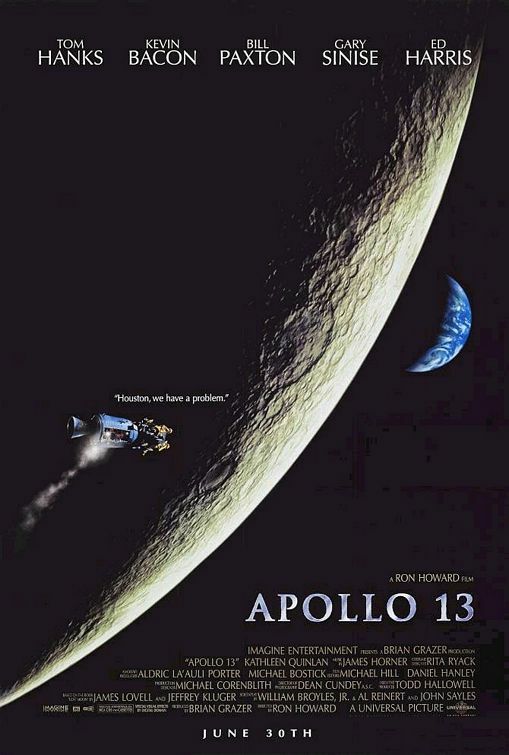 And every single person I knew thought that Apollo 13 was certain to be headed for Oscars, with its grand epic story, its panorama of humanity and the view from out there in space. But every single person I knew also thought that Smoke was the superior film. I don’t know what it is about Apollo 13 that somehow doesn’t cross the boundary from very good film to great film. Is it because it somehow seems like it was made to try to win Oscars? It is an epic story, straight from the pages of American history, told by a director who had already been passed over for an Oscar nomination when he received a DGA nomination once before (for Cocoon), starring Tom Hanks, coming off his back-to-back Oscar wins. Plus, there was the supporting cast, a great ensemble group, led by Gary Sinise, who had earned an Oscar nomination opposite Hanks the year before and also starring Ed Harris, who people were just starting to realize was a great character actor that everyone likes (and this would start his string of Oscar nominations) and Kevin Bacon, just as the six degrees about him was beginning to be a household word (and someday might start earning a string of Oscar nominations of his own). It would have great technical support, would like great on screen, with the cold cinematography of space contrasted against the deep pressure inside the NASA control room as the men on the ground try desperately to figure out whatever they can to save the men up above. It is interesting that Ron Howard would be passed up for an Oscar nomination (though he would win the DGA – the directors snubbing their noses at those in the Academy) for something so clearly designed to win Oscars, when the next two times he would pull this same routine – A Beautiful Mind and Frost/Nixon, the Academy would step right up and be ready and waiting. In fact, is it possible that had the Academy not snubbed Howard so blatantly (9 nominations, but not Director – had Howard been nominated, it would have been a much different race with probably much different results) that they never would have embarrassed themselves by giving him an Oscar over far more worthy nominees six years later? But all of this is a distraction from figuring out what it is about this film that doesn’t quite hold up. It’s not The Right Stuff, in spite of the presence of Ed Harris. Perhaps that is the problem. The Right Stuff told a story across the years and was long, but it used that length to help us learn something about the various characters who were part of the Mercury Program. Here, except for Lovell, played well by Tom Hanks, do we ever really get to know anyone here? And while the scenes of home life at the Lovell household, both before and during the fateful flight, while designed to help counterpoint the accident in space are merely a distraction. Yes, Kathleen Quinlan does a fine job as his wife, but are any of these scenes really necessary? Do we really need to see his daughter crying about how she hates Paul, just so we can have a little slice of life that the Beatles were breaking up at this same time. It all amounts to the same thing. The film actually drags at points, drags in a way that The Right Stuff never does. Yes, it is a fascinating story, and it is a compelling drama. But the film itself isn’t always a compelling drama and that may be why it never quite gets over that hump. And maybe that was what the voters saw and that’s what lead to Howard not joining the race. But that seems like an awful complex thing for voters to see who would then vote for Braveheart. The Film: Oh that pig. He swept everyone away with his determination and cuteness. It’s the kind of charming, lovable film that normally peaks with a Golden Globe nomination but snuck into a weak and bleak field to find its way into the final five at the Academy. It is a charming film, the kind of thing my son will enjoy (“I want to watch a movie about a pig,” he tells me). It has a very nice performance from James Cromwell (“Does James Cromwell ever play a good guy?” my mother constantly asks me. “Yes,” I always answer. “Babe.”) But let’s regain some perspective here. Visually, Babe looks very nice. In a weak year for visual effects, what they manage to do with these animals really does deserve its Oscar. And certainly the score and art direction are both very good. Cromwell’s performance helped him finally break through from mostly unknown to reliable character actor, though the notion that it deserved a nomination more than Patrick Stewart in Jeffrey or Alan Rickman in Sense and Sensibility is a bit silly. And then we come to the three big nominations. Best Adapted Screenplay? It’s a charming film and it actually makes good use of narration, something that films often struggle with (“Voiceover. McKee would not approve.” still rings in my head even though I think very poorly of McKee and his theories). But is the over-bearing cutsiness of the script really better than the dark wit of To Die For or Get Shorty? Is the direction, a solid job of gathering together all these animatronics, effects and actual humans, really more worthy of the final five than Ang Lee? And Best Picture? I understand that Leaving Las Vegas is one of the bleakest films ever made, but clearly it is a film of remarkable depth and power, as evidenced by its nomination in the four other major categories and that Babe clearly was a film that people really enjoyed, but really? Best Picture? Hell, this is the same year that Toy Story swept in the tide of computer animation and made everyone realize that this Pixar company was going to be one hell of a major player in the film scene and they went with the pig. This is the problem with the Oscars, in one sense. They make you get harder on films that deserve them. Braveheart is a mediocre film, but much of my fierce hatred of it is from the fact that it came in an won an Oscar (several, actually) that it didn’t deserve and I know people who have come to fiercely hate Crash, not because of flaws in the film, but because it beat Brokeback. Likewise, I actually like the film Babe; it’s a very good film, a great film to watch with kids. But I can’t possibly take it seriously as a Best Picture contender. Not because its a kids film – hell, I classify The Wizard of Oz as a kids film and it clearly ranks as one of the two or three greatest films ever made. It’s because Babe doesn’t ever feel like it’s more than a nice cute very good kids film. It’s a film to be watched with the family and enjoyed, but not a film like The Wizard of Oz or Bambi or Star Wars or Beauty and the Beast or the Toy Story films that you cherish down through the generations. And when it comes down to that, it just irritates me that it made the list. I still find Babe’s nomination for Picture funny. The talking pig was nominated for Best Picture? How? There’s a typo in the Sense and Sensibility entry. It doesn’t say what number nominee it is. I’m of two minds on Braveheart. All the issues you pointed out are valid (and it still got 2.5 stars from you! ), but at the same time I can’t help but enjoy it. Somewhat. It’s a forgettable movie that somehow won the Oscar. Winner is (sadly for you) Se7en. Correction made. I had filled in everything else before I re-watched it and had a ranking for it. Se7en? Ewww. I can only think of the Lemonheads song. I saw Braveheart on DVD a decade after it was made, and I admit that I liked it. But you are pitch perfect on your reasons for disliking it. And to be honest, while I love The King’s Speech, I despise Tom Hooper for stealing an Oscar from much better directors that year, so I can understand the sentiment of appreciating a film while hating it (even though you less “appreciate” Braveheart and more acknowledge that it is not worthless). Pathetically enough, I have not seen Sense and Sensibility or Il Postino. Apollo 13 is my high school physics teacher’s favorite film. He adores the emphasis Ron Howard placed on historical accuracy. The Zero-G scenes were all shot on the famous “Vomit Comet”, which by now the actors playing the astronauts have spent more time on than any actual astronauts. They used the actual computers of NASA Mission Control for their set. Even small details that most people assumed were for dramatic effect (Marilyn Lovell losing her ring, for example) were in fact historically accurate. I love it because it has such likable people, and such a fun sense of humor. “The president has granted you an extension on your taxes, seeing that you are out of the country” always cracks me up. I love the way they MacGyver a square peg into a round hole, and I love when it falls apart but they just keep walking. This works not only because of the humor but because of the characters. It is a success, and a rousing one at that. Babe is a great film. I love it, and I think you are absolutely right. It is not timeless, and children many years from now will probably never see it. And it certainly did not deserve its Best Picture nomination. The historical accuracy thing used to bother me, but it doesn’t now, and this is coming from someone with a Master’s in History; but I also double-majored in English for my BA, and many of the greatest stories ever written aren’t historically accurate in the least (most of Shakespeare, for instance, including “Richard III”, the play that inspired my choice for Best Picture for this year). Now, if you still don’t think the revised version is a good story, that ultimately doesn’t matter, of course. best picture: when I watch Land and Freedom, I think it is the best. When I watch Sense and Sensibility, I think this is the best. One of the worst years for the academy in terms of artistic achievement, the 4 of the nominees for best picture are regular or bad films: Braveheart has good fight scenes, good cinematography and music but the script is terrible and the acting awful. Babe is very enjoyable if you are a kid under 8, not a bad film but just a very limited one. Apollo 13 is so pro American is like a propaganda film, has good technical aspects, but the rest is like a Ron Howard film: good ideas and crew but with a very limited director. Il postino has some charms (the music is fantastic) but the whole is forgettable. So, Sense and Sensibility is the best among the nominees, a solid script, good direction and great performances. The acting awards were right for Sarandon (DEad man walking) and Spacey (The usual suspects), but Sean Penn deserved a first oscar for Dead man and Mira Sorvina has showed that her award was only because of the great lines written by Woody Allen, Joan Allen (Nixon) or Kate Winslet (Sense) deserved the award instead. I don’t really understand your dislike for Austen, and do you know that quote from pride and prejudice is from narrator and not a spoken line. But even tough I like bouth Austen and the Sense and Sensibility movie I would not have given it best picture since it is a classic litterature and you just should not give awards to something that has been done before if its not truly exceptional. Ps English is not my first language. It’s a shame Braveheart gets hated on so much. It is a great film. I saw much of it a year ago and was taken aback by some of the dialogue. And yes, Gibson’s performance is all star charisma and power, but it is still powerful. He really doesn’t do much to get into character but I think he leads the line, so to speak. And despite some of the dialogue, the writing is strong. The cinematography is there and the editing is strong. His directing is standout. It’s fierce and hateful, and I think the hate thing is under-appreciated. The homophobic thing is painfully overplayed. And the history part is truly irrelevant. You would not be so zoned in on these things if you liked the film more. But you’re almost defending your dislike for the film on that basis. And that’s off the mark. Braveheart is one of those films that I’m supposed to dislike and cede as Academy fodder, but I still think it’s great. Forrest Gump still has its great admirers, but suffers from a similar (tho much less contemptuous) fate. I still see them as great films. You have a great site tho.